Anyone who frequently travels on Amtrak knows that the national rail service isn't exactly the most reliable mode of transport. Scenic rides and ridiculously cheap tickets notwithstanding, its trains often run quite behind schedule, and their cabins aren't exactly luxurious. 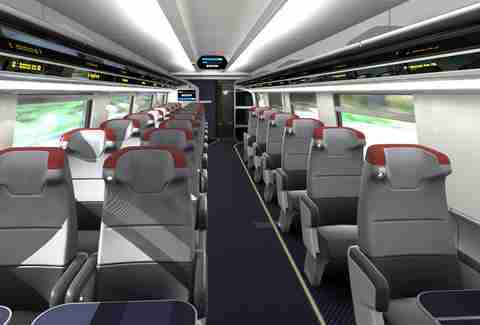 That's why regular rail riders should be pumped about Amtrak's latest update on its ongoing work to launch high-speed Acela Express trains with luxe interiors and improved service along its Northeast Corridor. Somewhere, Joe Biden is probably smiling ear to ear. 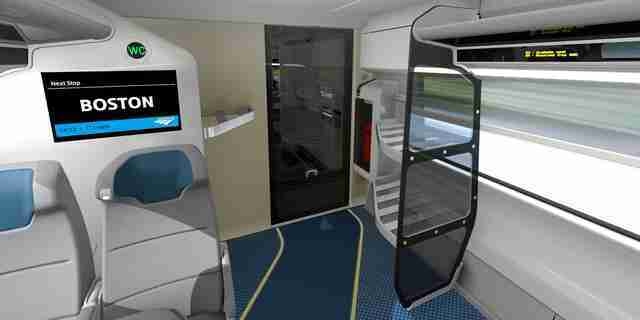 On Wednesday, Amtrak unveiled concepts for the interiors of its new Acela Express trains, which are expected to hit the rails by 2021. The design promises some serious improvements for anyone who plans to hitch a ride on its speedy flagship route along the Northeast Corridor, which travels from Washington, DC to Boston. 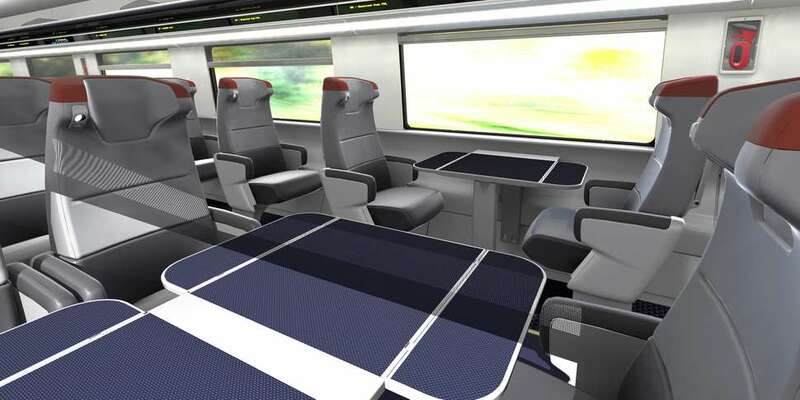 Besides appearing a lot sleeker and more streamlined than the current Acela cars, the new cabins will offer quite a few new convenient amenities including dual tray tables for each passenger (small and large), electrical and USB outlets, integrated in-seat lighting, improved WiFi, and a new seat reservation system that better distinguishes seat availability. 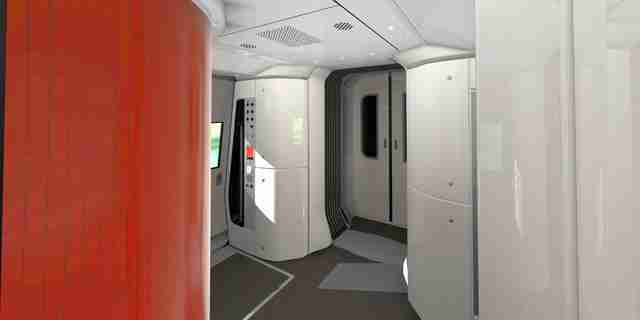 Beyond that, the cars will have bigger bathrooms, passenger capacity that's roughly 30% higher than what it is now (without cutting seat space), streamlined overhead luggage space, and a series of six LED screens to better communicate info from the conductor about upcoming stops or alerts. The unveiling of the new Acela Express cars comes on the heels of Amtrak's recent announcement that it's pouring $370 million worth of equipment and maintenance into improving the Northeast Corridor over the next three years in an effort to boost service along the heavily trafficked route. “More than 890,000 Amtrak customers and commuter passengers rely on the Northeast Corridor for transportation every weekday, and we are working to make their ride smoother and more reliable,” said Amtrak Executive Vice President and Chief Operating Officer Scot Naparstek in a press release. The dual efforts are part of a grand plan Amtrak has put in motion following a $2.45 billion loan from the government, which will go toward a full-scale improvements across the board along its East Coast hubs. “This includes investing in infrastructure needed to improve the on-board and station customer experience that will accommodate the increased high-speed rail service levels. Amtrak will invest in significant station improvements at Washington Union Station, Moynihan Train Hall New York, as well as track capacity and ride quality improvements to the [Northeast Corridor] that will benefit both Acela Express riders and other Amtrak and commuter passengers," according to an Amtrak spokesman ,who spoke to Conde Nast Traveler. Unfortunately, you're going to have a wait a bit to experience all the newness, especially on Acela trains. Amtrak anticipates that its first prototype will be ready by 2019, but that the first new car won't actually hit the rails until 2021. Then again, if you're a frequent Amtrak customer, then you're already accustomed to a bit of a wait.